Don Fisher's Presidio Art Museum has a new look. 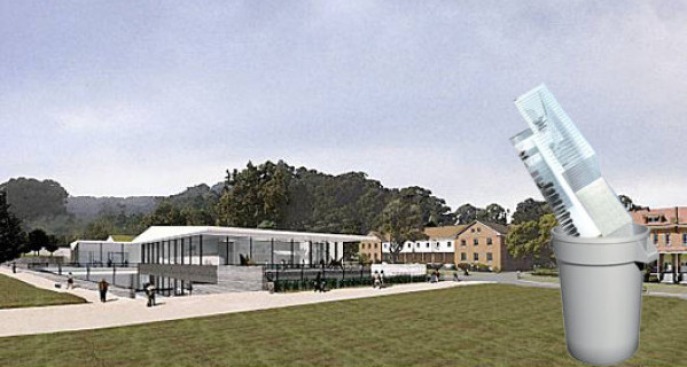 After much bit-chomping: above is the completely new design for CAMP, Don Fisher's Presidio art museum, courtesy one arch critic John King. Designed by WRNS Studio, which was the partner firm with architect Richard Gluckman on the previous (and much-reviled) white-box design, the new building is a "deferential, not dominant" design that is no longer an "icon unto itself," says King. Gallery spaces will be long and narrow, and the building itself is sunken halfway underground. Finally, a green roof tops CAMP, assuring us that no museum in San Francisco will ever again be built without grass on top. The National Park Service, which said the museum shouldn't stand out as you "sweep your eyes across" the parade ground, said "they've come a long way improving the design," but there won't be approval until the designs are finalized. Still, the Presidio Historical Association maintains that the problem with CAMP is location, not size. So: successful compromise, or has halftime on the apocalypse just ended?